Boneless Rib Roast, A Very Tender And Juicy Pork Roast. The top 2 photos are a single rib loin roast and the bottom 2 photos are two rib roasts stack one on top of the other and tied together for one large roast. 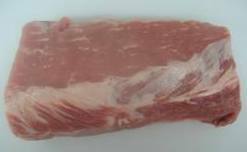 The boneless rib is the rib portion of the loin, closest to the shoulder. A similar cut to the center pork loin but with more marbling and better flavor, some compare it to the prime rib in beef. The rib end has slightly more fat than the center so therefore juicier and is easier to carve with the bones removed. 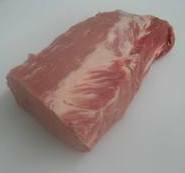 It adapts well to a brine, marinades, glazes, dryrubs, and for maximum tenderness do not cook a pork roast no more than medium doneness. Most recipes call for cooking temperatures of 325-350 degrees and some even higher when cooking a pork loin roast. What happens in my experience cooking a pork loin roast at a higher temperature will cause a roast to dry out on the outer parts and shrink more depending on the size of the roast by the time its done cooking. A low temperature of 300 degrees will cook the meat evenly through from the center to the outer edge without any drying out, leaving the meat tender and juicy. A boneless rib roast can be purchased as a single roast or a double. A double is simply 2 singles stacked one on top of the other, tied with butchers twine at even intervals giving the roast an even round shape. A double roast is great for a larger crowd. 1. An hour before cooking remove the roast from the refrigerator to bring to room temperature. 2. Heat oven to 300 degrees, adjust the oven rack to middle position. Meanwhile heat a skillet over medium high heat with 1 tablespoon of vegetable oil. Sprinkle the roast evenly with salt and pepper and any of your favorite seasonings or spices. 3. When skillet is smoking about 4-5 minutes add the roast, fat side up if a single loin. Brown the roast on all sides about 2 minutes per side, fat side last, lower temperature if the roast is burning. 4. Transfer roast to roasting pan on a rack set inside the pan. Cook until the internal temperature reaches 145-150 degrees using an instant read thermometer inserted into the center of the roast. 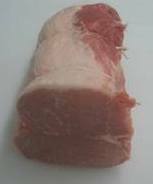 Pork roast cooking time of approximately 25-30 minutes per pound should register about 145-150 degrees. 5. Remove the boneless rib roast from the oven, transfer to a cutting board and tent loosely with foil 15-20 minutes. The internal temperature will rise about 5-10 degrees while resting to a temperature of 155-160. For maximum tenderness do not cook past this temperature. 6. Cut the twine off the roast, slice thinly across the grain and serve. 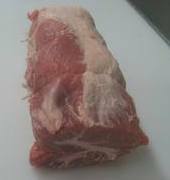 Bonless rib end makes for great recipes for leftover pork roast. Below is a cooking chart for pork roast. Remember you should always use an instant-read thermometer to check the doneness of a roast. The internal temperature will rise about 5-10 degrees during resting time, remove the roast 5-10 degrees before desired doneness. It is not recommended pork be cooked less than medium doneness.